BEFS (Built Environment Forum Scotland) this week organised an evening seminar asking: How can the planning system contribute to wellbeing in a fairer Scotland? Alongside Alex Neil MSP, Cabinet Secretary for Social Justice, Communities and Pensioners’ Rights and Sir Harry Burns, Professor of Global Public Health, University of Strathclyde, I was delighted to represent RTPI Scotland on the panel. The evening was chaired by Petra Biberbach, Chief Executive of PAS. Alex Neil began the evening by emphasising the absolute need for planning to create healthier places. Harry Burns then described how those healthier environments might look and feel. I felt it was then my turn, as the planner, to take up the vital challenge of explaining how we might deliver those healthier places. This post recounts what I chose to say. My key message was that planners have a vital role in delivering the ‘healthier places’ that Alex Neil and Harry Burns rightly say are so important for our future. Health and wellbeing shouldn’t be unfamiliar territory for the planning profession. Our roots lie in Victorian health and sanitation concerns. But planning moved away from those Victorian public health concerns in the 20th century, a reflection that cholera, typhoid and smallpox are no longer the issues in our towns and cities that they once were. Health and wellbeing have, however, returned to the top of the UK planning agenda in the last decade. Not due to a re-emergence of deadly infectious diseases like cholera; but linked to pollution, lack of exercise, obesity and – as Sir Harry explained very articulately – a lack of empowerment over many of our lives and our communities. There are some excellent Scottish examples of planners trying to address health and wellbeing. For example, the nine Equally Well pilots promoted by the Scottish Government while Sir Harry was Chief Medical Officer, including one in Glasgow’s East End that I was was fortunate enough to work on with Glasgow City Council and Willie Miller Urban Design. The East End pilot took forward Harry’s premise that planning for health and wellbeing (or wellness, to use Sir Harry’s preferred term that is more encompassing of mental and spiritual well-being) is not just about physical environment interventions – less air pollution, walkable neighbourhoods, access to greenspace for recreation and nature – but also greater empowerment for individual people over their lives and the future of their community. In other words, a more engaged and empowered community is likely to be a community with greater levels of individual wellness. The trouble is, examples like the Equally Well pilots are relatively isolated. Although physical interventions like more greenspace, less air pollution, more carbon reduction and more walkable neighbourhoods are now finding their way into planning policy, we are only slowly making Harry’s link between community empowerment and health/wellbeing. But there is a big opportunity here. The Scottish Government’s clear focus on community empowerment and the Review of the Scottish Planning System means that planning is in an ideal position not only to support community engagement and empowerment, but to link it more explicitly with health and wellbeing. Keep on mainstreaming the physical interventions about walkability, carbon reduction, pollution and greenspace in planning policy, masterplans and other plans. Better integrating spatial planning and Community Planning – a much talked about but rarely achieved challenge, with a few local authorities including Angus, East Ayrshire, Fife and North Lanarkshire pioneering new approaches that can lead led to joint initiatives between town planners, community planning and the NHS.such as Motherwell town centre’s dementia-friendly garden. Learn from excellent initiatives like Glasgow Centre for Population Health, which has for a number of years worked hard to link various public sector players around a central agenda of health and wellbeing. 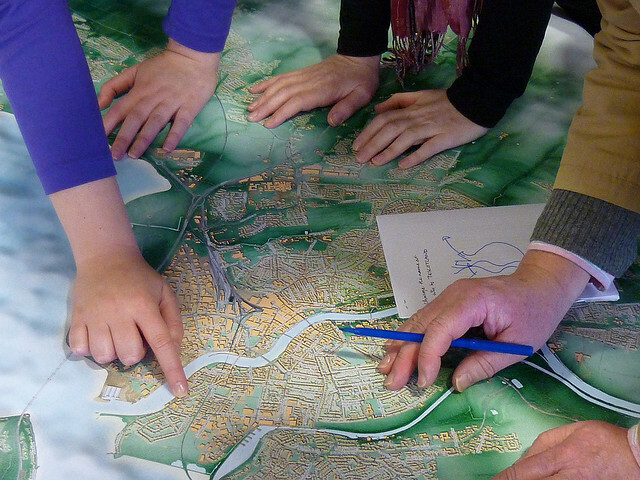 Genuinely give more opportunities to empower communities to shape their places. This is one of the stated objectives of the current Planning Review – which is why RTPI Scotland’s response, alongside others, put forward suggestions to the Planning Review such as more community engagement early on in the formulation of plans (to give communities more influence) and more mediation (so the locus of control of a community’s future remains closer to them, rather than centralised to a distant ‘authority’). There is another way that planners can support better health and wellbeing. It’s perhaps less obvious, but potentially very powerful. It’s by thinking of ourselves as brokers. Let me illustrate this through an example. I am currently working on Community Action Plans for three villages in South Lanarkshire: Coalburn, Douglas and Glespin. They have been with wave after wave of job losses and challenges of rural isolation (although they do also have wonderful levels of community activity and resilience). Just last week, I was speaking to a local GP who said that the most intractable problem for these communities, in his view, was disengaged young men causing misery in their communities. Those words really struck me. What on earth, I thought, can land use planning possibly do to solve such a challenging social and economic issue? At face value, I thought, nothing. Planning policy, planning applications and Local Development Plans can only fiddle at the edges. But, reflecting on it, I realised that there is actually a great deal that I can do – if I recognise that I am a broker. I can organise a meeting or workshop to broker that GP meet with social enterprises, businesses, housing associations and local authorities who might never otherwise have met, but who all have a shared interest in making those communities better; who knows what collaborations might come out of those conversations to help the disengaged young men. Equally, the Community Action Plans that I will help produce can overtly support local employability initiatives or improved access to opportunities, increasing their ability to tap into community benefit money from windfarms or other sources of funding. So – there are very real things that I, as a planner, can do to help those disengaged young men lead healthier and more fulfilled lives. Simply by realising the power that I have as a broker, I personally can do something very significant to deliver the built environment and improve people’s lives. All we need to do is make connections and get people talking.